With Robot Shimon, Continental Ceili Combo ensemble and the Machine Folk algorithms of Bob L. Sturm et al. What happens when traditional Irish folk music is given to machines and robots for their interpretation? How do these machines understand human music enough to compose and perform it? What are the possibilities for humans and machine collaboration? This event will see performances from Shimon the Robot with the Continental Ceili Combo ensemble. They will perform a collection of folk tunes composed by artificial intelligence. The compositions are part of a project by Bob L. Sturm of the Centre for Digital Music of the Queen Mary University in London. During the event he will talk with Luba Elliott, IMPAKT Festival 2018 curator, and industrial design researcher Kristina Andersen about the role of artificial intelligence in developing music and other forms of human creativity. Some of the folk tunes you will hear are created by an artificial intelligence that has analysed real folk music from Ireland and the UK. The computer has learned enough on its own that it can create new tunes sharing many of the characteristics of the real tunes. 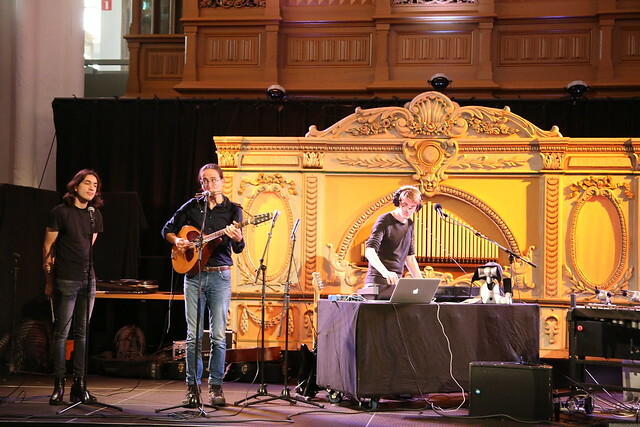 This particular system has already composed 100,000 new tunes on its own, and has been used to create dozens of new musical compositions in collaboration with human experts. The system is designed to augment human music creativity and experience. A Robot Folk Jam Session is a collaboration between IMPAKT and Museum Speelklok, organized in the framework of the Robots Love Music exhibition. Please note that a visit to the museum is included in the entree fee. Since the exhibition will close at 17:00 it is advised to see it before the event starts.